The concept of intensity-based assessment for risk-based decision-making was recently introduced, and realized by 3R method (Record selection, Response analysis and Risk-based decision making), which can be used to check the adequacy of structural seismic safety. The objective of the method is estimation whether the seismic collapse risk is lower or larger in comparison to target collapse risk, which is assumed acceptable. This can be estimated with high accuracy on basis of results of only few nonlinear dynamic analyses at single intensity by using carefully selected ground motions, which are termed characteristic ground motions (CGMs). The engineer can decide that the structural seismic collapse safety is suitable when collapse is observed in the case of less than half of, for example, seven CGMs. On the other hand, if collapse is observed in case of more than half CGMs, the collapse risk is estimated to be too large. The decision model is therefore straightforward, if appropriate CGMs are used. The purpose of this application is to select seven CGMs in a user friendly manner. The selection of CGMs in the 3R method is two-step procedure. In the first step the ground motions are selected in accordance with the target collapse risk and seismic hazard at the site. In the second step the smaller set of seven CGMs is selected on basis of computationally non-demanding analysis of simplified structural model with one degree of freedom, which is defined on basis of pushover analysis results. CGMapp performs this selection automatically, which enables fast and efficient decision-making about adequacy of seismic safety in accordance with the 3R method. 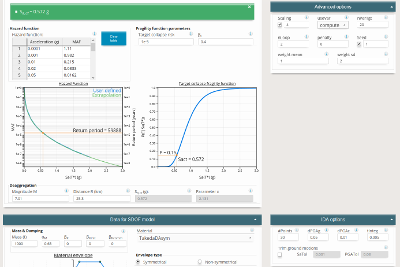 The purpose of the application is to calculate risk-targeted design seismic intensity and/or risk-targeted behaviour factor q which can be used for the force-based design of structures. The application allows the assessment of risk-targeted design seismic intensity and/or behaviour factor q for arbitrary structural type, target collapse risk and location of structure if only certain structural parameters are assumed. In the first step the risk-targeted intensity causing collapse, which represents the median value of the risk-targeted intensities causing collapse of a structure, is calculated by taking into account target probability of collapse, hazard curve for the location of the structure and assumed value of standard deviation of natural logarithms of seismic intensities causing collapse of the structure. Follows the calculation of reduction factor r. The reduction factor is calculated taking into account difference between the shape of design spectrum and median spectrum of selected ground motions, overstrength reduction factor, ductility of the structure and nonlinear response of idealized SDOF model. The risk-targeted design intensity is obtained by reducing risk-targeted intensity causing collapse with reduction factor r. Based on seismic intensity for selected return period, risk-targeted collapse intensity and reduction factor r also the risk-targeted behaviour factor is calculated. The risk targeted behaviour factor can be used for design of the structure using similar procedure as that presented by Eurocode. Application provides simple user interface which enables search, display and download capabilities from IKPIR strong ground motion database. 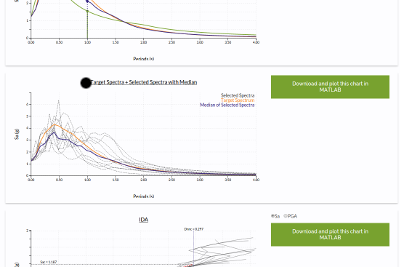 Queries are possible by providing various criteria ranging from basic meta data like earthquake magnitude and location to more specific like specifying spectral acceleration interval at desired period. 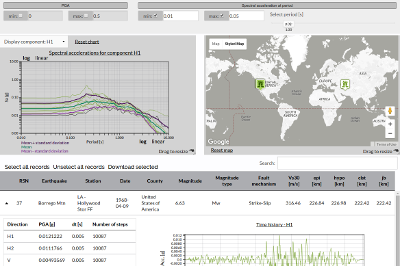 Application displays spectral accelerations of selected records, their mean and standard deviations, earthquake locations, acceleration time histories and other meta data. All this data can also be downloaded to users computer. Database of strong motions was developed and updated under multidisciplinary research program NGA West, coordinated by the Lifelines Program of the Pacific Earthquake Engineering Research Center (PEER), in partnership with the U.S. Geological Survey and the Southern California Earthquake Center. RESORCE (Reference database for Seismic grOund-motion pRediction in Europe) is a freely accessible platform for accessing and retrieving reliable ground-motion data from pan-European earthquakes and associated seismological and geotechnical parameters.